Through our strategic partnerships, we are able to offer full fabrication capabilities, specializing in structural steel, piles & pile guides, plate girders, pressure vessels, and pipework. With access to a state of the art, 14,000 Sq. 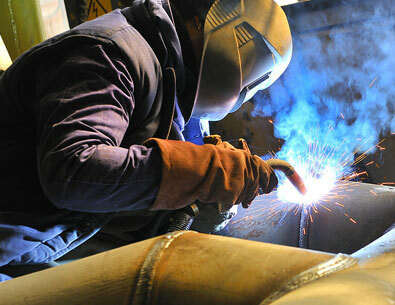 Ft. fabrication facility and our in-house engineering services, we have the resources and ability to deliver a wide variety of customized, specialized welding and fabrication projects. As a one-stop-shop for design, construction, and management, we are able to meet immediate response requirements with 24 hour capability and seamless coordination to address mechanical outages and project needs. Our multi-service approach eliminates interface issues that inevitably occur when using different contractors. This will minimize downtime and deliver a safer and higher quality product at a competitive price. TASC has strategic partnerships with select fabrication facilities across Canada giving us the capacity to quickly address changes in project scope and schedule. We are ABSA, TSSA, and CWB certified and have a number of welding procedures to cover all manner of weld types and material grades.